A Burberry coat is one of those classic staples that never goes out of style. 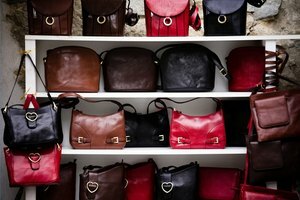 Its luxury craftsmanship means it comes with a high price tag, and so there are plenty of fakes out there. Here's how to check a Burberry coat's authenticity. Check the hang tag, the buttons, and the tag in the lining for the logo. There are lots of "Rurberry" and "Burbery" trench coats posing as the real thing. One of the key elements on the Burberry logo is how the capital "R" has a small horizontal line (a serif) on the left-hand side. The logo's font is always the same, whether on a button or a tag. Check the checks. 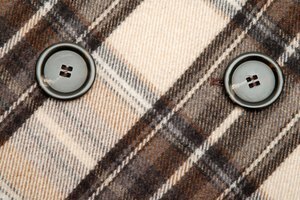 Burberry's signature plaid lining is often imitated but rarely copied perfectly. The Nova Check design should be symmetrical, lining up across seams. The color consists of three thick navy blue stripes crosshatching one another and three thinner red stripes crossing the center of the blue check. Look at and touch the lining, the buttons, and the fabric of the coat. Burberry uses only top-quality materials. Buttons and belt loops should be sewed on firmly. Stitches should be even and tight. The lining is never crooked or puckered. The hem should be straight. Examine the hang tag. It would not be a Burberry without the distinctive tag. The logo and spelling on the tag should match the signature Burberry logo. The material attaching the tag to the jacket should be solid, requiring scissors to remove it rather than simply tugging. Remember to keep the hang tag after removing it because items cannot be removed or exchanged without the tag. If all else fails, consult the experts at a designer imposter forum. Many of these people are ardent collectors of Burberry items or work in retail selling luxury goods. They have developed an eye for authentic Burberry coats as well as the telltale signs of a fake. 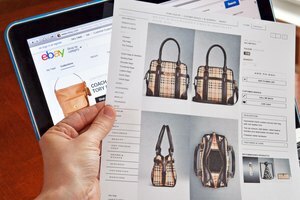 Buy Burberry pieces directly from the designer or at a reputable department store, such as Saks Fifth Avenue.